KOHLER® soap/lotion dispensers are designed to be filled from above the countertop. Gently pull the head and pump assembly up from the base. Set the assembly aside. Pour soap or lotion into the top of the base. Check the level in the bottle frequently to avoid over filling. Replace the head and pump assembly. Dispenser assemblies manufactured prior to 2005 use a clear bottle with a 1" (25 mm) opening. For a replacement bottle, order kit number 1038230. 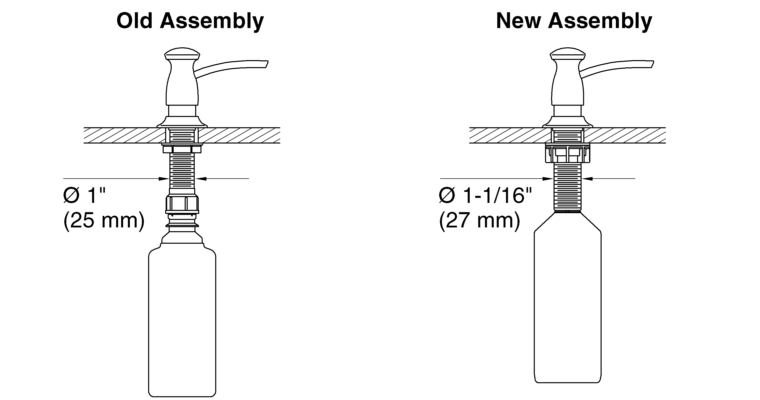 Newer assemblies use a frosted white bottle that has a 1-1/16" (27 mm) opening. The new bottles will NOT fit the old soap dispensers. For a replacement bottle, order part number 1039513. The consistency of some liquid soaps is thin or watery and may not "squirt" properly from the dispenser. Use a thicker liquid soap, such as Softsoap®, which will dispense from the spout at a more downward angle.